The paper Ultrafast quantum interferometry with energy-time entangled photons by JP MacLean, John Donohue, and Kevin Resch was published in Physical Review A.
Abstract: Many quantum advantages in metrology and communication arise from interferometric phenomena. Such phenomena can occur on ultrafast timescales, particularly when energy-time entangled photons are employed. These have been relatively unexplored as their observation necessitates time resolution much shorter than conventional photon counters. Integrating nonlinear optical gating with conventional photon counters can overcome this limitation and enable subpicosecond time resolution. Here, using this technique and a Franson interferometer, we demonstrate high-visibility quantum interference with two entangled photons, where the one- and two-photon coherence times are both subpicosecond. We directly observe the spectral and temporal interference patterns, measure a visibility in the two-photon coincidence rate of (85.3±0.4)%, and report a Clauser–Horne–Shimony–Holt–Bell parameter of 2.42±0.02, violating the local-hidden variable bound by 21 standard deviations. The demonstration of energy-time entanglement with ultrafast interferometry provides opportunities for examining and exploiting entanglement in previously inaccessible regimes. One of the images was selected for Kaleidoscope. Thanks Blender! We have a new paper, Direct Characterization of Ultrafast Energy-Time Entangled Photon Pairs, by JP MacLean, John Donohue, and Kevin Resch that just appeared in Physical Review Letters. It was selected as an Editors’ Suggestion and Featured in a Synopsis in Physics. Abstract: Energy-time entangled photons are critical in many quantum optical phenomena and have emerged as important elements in quantum information protocols. Entanglement in this degree of freedom often manifests itself on ultrafast time scales, making it very difficult to detect, whether one employs direct or interferometric techniques, as photon-counting detectors have insufficient time resolution. Here, we implement ultrafast photon counters based on nonlinear interactions and strong femtosecond laser pulses to probe energy-time entanglement in this important regime. 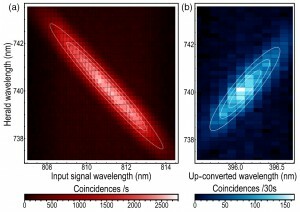 Using this technique and single-photon spectrometers, we characterize all the spectral and temporal correlations of two entangled photons with femtosecond resolution. This enables the witnessing of energy-time entanglement using uncertainty relations and the direct observation of nonlocal dispersion cancellation on ultrafast time scales. These techniques are essential to understand and control the energy-time degree of freedom of light for ultrafast quantum optics. Observation of Genuine Three-Photon Interference. Sascha Agne, Thomas Kauten, Jeongwan Jin, Evan Meyer-Scott, Jeff Z. Salvail, Deny R. Hamel, Kevin J. Resch, Gregor Weihs, and Thomas Jennewein, Phys. Rev. Lett. 118, 153602 (2017). To Sascha Agne and Thomas Jennewein of the University of Waterloo and colleagues and Stefanie Barz, Steve Kolthammer and Ian Walmsley of the University of Oxford and colleagues for independently measuring quantum interference involving three photons. Seeing the effect is very difficult because it requires the ability to deliver three indistinguishable photons to the same place at the same time and also to ensure that single-photon and two-photon interference effects are eliminated from the measurements. As well as providing deep insights into the fundamentals of quantum mechanics, three-photon interference could also be used in quantum cryptography and quantum simulators. Kent Fisher was awarded the WB Pearson medal for his outstanding PhD thesis, Photons & Phonons: A room-temperature diamond quantum memory. Congratulations Kent! Also, welcome to Patrick who is (re)joining the group as an MSc candidate and welcome to Austin who is joining us for the summer after USEQIP! About the Pearson award: This medal was created to honour Professor W.B. Pearson in recognition of his contribution to the University of Waterloo and to Canada as a research scientist and teacher. One medal will normally be awarded annually to a Doctoral student from each department in the Faculty of Science at the discretion of the department concerned in recognition of creative research as presented in the student’s thesis. Photo: Kent Fisher and Dean of Science Bob Lemieux at the Science Award Ceremony held in conjunction with Convocation 2017. Our paper, Quantum-coherent mixtures of causal relations, by JP MacLean, Katja Ried, Rob Spekkens and Kevin Resch was published today in Nature Communications. This work was the result of a collaboration between the Quantum Optics and Quantum Information group at the University of Waterloo (IQC/Physics) and the Perimeter Institute. Abstract: Understanding the causal influences that hold among parts of a system is critical both to explaining that system’s natural behaviour and to controlling it through targeted interventions. In a quantum world, understanding causal relations is equally important, but the set of possibilities is far richer. The two basic ways in which a pair of time-ordered quantum systems may be causally related are by a cause-effect mechanism or by a common cause acting on both. Here we show a coherent mixture of these two possibilities. We realize this nonclassical causal relation in a quantum optics experiment and derive a set of criteria for witnessing the coherence based on a quantum version of Berkson’s effect, whereby two independent causes can become correlated on observation of their common effect. The interplay of causality and quantum theory lies at the heart of challenging foundational puzzles, including Bell’s theorem and the search for quantum gravity. 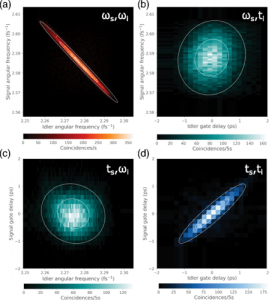 Our article, Observation of Genuine Three-photon Interference, by Sascha Agne, Thomas Kauten, Jeongwan Jin, Evan Meyer-Scott, Jeff Z. Salvail, Deny R. Hamel, Kevin J. Resch, Gregor Weihs, and Thomas Jennewein was published in Physical Review Letters. This work was a collaboration between groups at IQC and the University of Innsbruck. The paper was discussed as a Viewpoint in Physics, Photonic Hat Trick, by Robert Sewell and was also selected as a Editor’s Suggestion. Abstract: Multiparticle quantum interference is critical for our understanding and exploitation of quantum information, and for fundamental tests of quantum mechanics. A remarkable example of multi-partite correlations is exhibited by the Greenberger-Horne-Zeilinger (GHZ) state. In a GHZ state, three particles are correlated while no pairwise correlation is found. The manifestation of these strong correlations in an interferometric setting has been studied theoretically since 1990 but no three-photon GHZ interferometer has been realized experimentally. Here we demonstrate three-photon interference that does not originate from two-photon or single photon interference. We observe phase-dependent variation of three-photon coincidences with (92.7±4.6)% visibility in a generalized Franson interferometer using energy-time entangled photon triplets. The demonstration of these strong correlations in an interferometric setting provides new avenues for multiphoton interferometry, fundamental tests of quantum mechanics, and quantum information applications in higher dimensions. Morgan Mastrovich has joined the group as an MSc candidate and wasted no time in publishing her first paper with us – Welcome Morgan! John Donohue successfully defended his PhD thesis, Ultrafast manipulation of single photons using dispersion and sum-frequency generation. Congratulations Dr John! 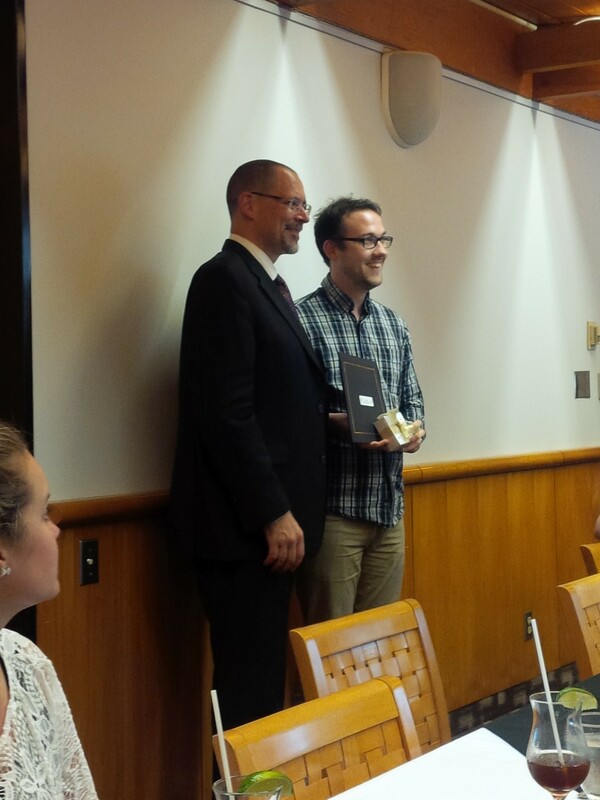 Kent Fisher successfully defended his PhD thesis, Photons & Phonons: A room-temperature diamond quantum memory. Congratulations Dr Kent! Our paper, Phonon-Mediated Nonclassical Interference in Diamond, by Duncan England, Kent Fisher, Jean-Philippe MacLean, Philip Bustard, Khabat Heshami, Kevin Resch, and Benjamin Sussman was published in Physical Review Letters. This work is the result of a collaboration with Ben Sussman’s Quantum Technologies Laboratory at the National Research Council Canada. Abstract: Quantum interference of single photons is a fundamental aspect of many photonic quantum processing and communication protocols. Interference requires that the multiple pathways through an interferometer be temporally indistinguishable to within the coherence time of the photon. In this Letter, we use a diamond quantum memory to demonstrate interference between quantum pathways, initially temporally separated by many multiples of the optical coherence time. The quantum memory can be viewed as a light-matter beam splitter, mapping a THz-bandwidth single photon to a variable superposition of the output optical mode and stored phononic mode. Because the memory acts both as a beam splitter and as a buffer, the relevant coherence time for interference is not that of the photon, but rather that of the memory. We use this mechanism to demonstrate nonclassical single-photon and two-photon interference between quantum pathways initially separated by several picoseconds, even though the duration of the photons themselves is just ∼250 fs. Our article, An experimental test of noncontextuality without unphysical idealizations, by Mike Mazurek, Matt Pusey, Ravi Kunjwal, Kevin Resch, and Rob Spekkens was just published in Nature Communications. This work is the result of a collaboration between IQC and the Perimeter Institute on Experimental Quantum Foundations. Abstract: To make precise the sense in which nature fails to respect classical physics, one requires a formal notion of classicality. Ideally, such a notion should be defined operationally, so that it can be subject to direct experimental test, and it should be applicable in a wide variety of experimental scenarios so that it can cover the breadth of phenomena thought to defy classical understanding. Bell’s notion of local causality fulfils the first criterion but not the second. The notion of noncontextuality fulfils the second criterion, but it is a long-standing question whether it can be made to fulfil the first. Previous attempts to test noncontextuality have all assumed idealizations that real experiments cannot achieve, namely noiseless measurements and exact operational equivalences. Here we show how to devise tests that are free of these idealizations. We perform a photonic implementation of one such test, ruling out noncontextual models with high confidence.